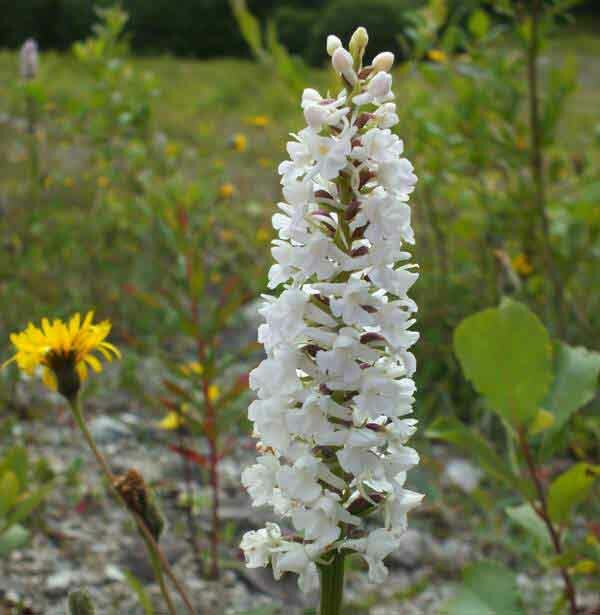 The Fragrant-orchids have been the subject of much molecular study in recent years, and as a result of differences revealed between them, the three British-growing varieties currently recognised as Gymnadenia conopsea (Chalk Fragrant-orchid), Gymnadenia borealis (Heath Fragrant-orchid) and Gymnadenia densiflora (Marsh Fragrant-orchid) may eventually be accepted as three distinct species. The third of these types, Marsh Fragrant-orchid, grows in alkaline marshy ground and is therefore more easily distinguishable by habitat if not by obvious morphological differences. 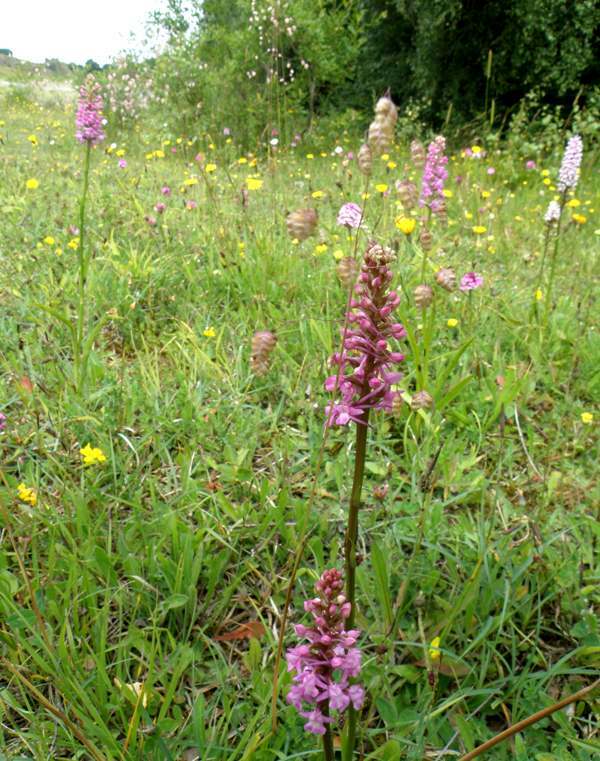 The remaining types, Chalk Fragrant-orchid and Heath Fragrant-orchid are more difficult to tell apart. Normally growing to a height of around 40cm, exceptionally to 60cm, this orchid has 3-6 narrow pointed basal leaves. There are also a few smaller bracts higher on the stem but beneath the flowers. The inflorescence is cylindrical and much narrower than those of the Pyramidal Orchid Anacamptis pyramidalis with which this orchid is sometimes confused. Each plant can carry up to 200 individual flowers which are usually mauve rather than pink or purple and have broad lips. Occasionally pure white flowers appear within ccolonies of mauve Chalk Fragrant-orchids. The flowers have an instense perfume which is particularly noticeable in the evening or early morning. This orchid is well distributed throughout Europe and into eastern Asia, China and the Himalayas but they are rarely found in the Mediterranean zone. In the Alpine dry meadows of Slovenia the Chalk Fragrant-orchid grows alongside Gymnadenia odoratissima, offering a unique opportunity to make comparisons between the two species. In Wales and other parts of the UK they are particularly numerous in coastal dune slacks, a habitat rich in chalk due to the high content of crushed sea shells present there. 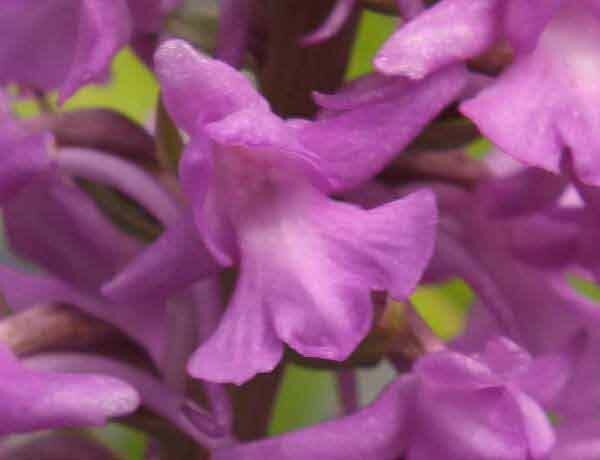 Two excellent places to see the Chalk Fragrant-orchid are Kenfig National Nature Reserve in South Wales, and Newborough Warren National Nature Reserve in Anglesey in North Wales. 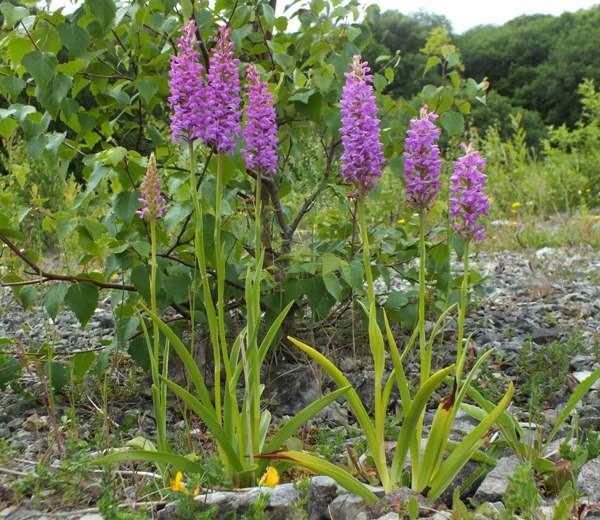 In Ireland The Burren is an outstanding place to see these lovely orchids. Mid-May to July, with June being the peak flowering period in Britain and Ireland.